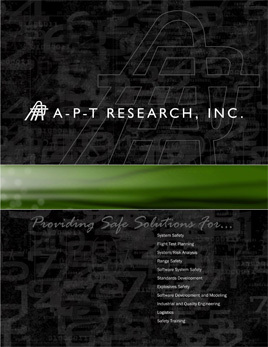 About APT » A-P-T Research, Inc.
A unique feature of APT is that we use and have developed a variety of software, models, and analytical tools for evaluating hazards and risks in the areas of explosives safety, flight safety, ground safety, and environmental engineering. APT’s mission is to deliver safe, reliable, and innovative Analysis, Planning, & Test solutions and services that exceed expectations, build employee pride of ownership, and optimize shareholder value. APT’s corporate vision is to be the most nationally-respected safety and technical engineering services provider to the U.S. Government and our commercial clients. We strive to foster an employee-owned culture based upon exceptional ethical behavior that supports our team members, recognizes exceptional performance, and delivers on customer commitments. APT was founded with the fundamental understanding that defense testing follows a unique sequence of analysis, planning, testing, and once again, analysis. At the first step in the test and evaluation process, system analyses define the operating concepts and performance requirements which must be evaluated. The second step is planning for the test process. Multiple engineering and support activities are needed. Activities include developing the test program; defining test constraints such as treaties, range safety and environmental impact; defining specific test scenarios and targets; developing data needed to support the program; and coordinating plans among all involved agencies. Test is the third step in the sequence. Ground tests build toward flight tests. Results from these, in turn, validate hardware in the loop (HWIL) simulations. Since some defense systems cannot be fully tested, the final proof lies in the same types of system analyses which define the requirements. The difference, however, is that this time the models have been validated by testing. All APT brochures are in PDF format and require Adobe Acrobat Reader in order to be viewed. 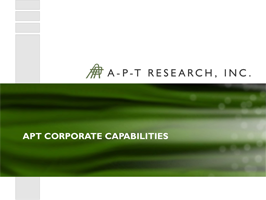 APT Technical Solutions, Inc. (ATS) is a wholly owned subsidiary of APT. ATS is a small business based in Huntsville, Alabama. ATS provides test support services to Government and commercial customers in the areas of missile and aircraft testing, component testing, environmental testing, test management, and other engineering related support services.